One of my favorite sports is trying to point out where geek friends of mine made a mistake or perhaps didn’t know something I knew about. I know, it’s childish but I really truly enjoy it. Ask Dave Hamilton. Anyway, one of the people I enjoy torturing most is Don McAllister. I think it’s because he is so amazing and finds these tricks and things I would never find in a million years, so catching him out is the best fun. I was watching his iOS 12 tutorial on ScreenCasts Online and he was demonstrating some features using an iPad. 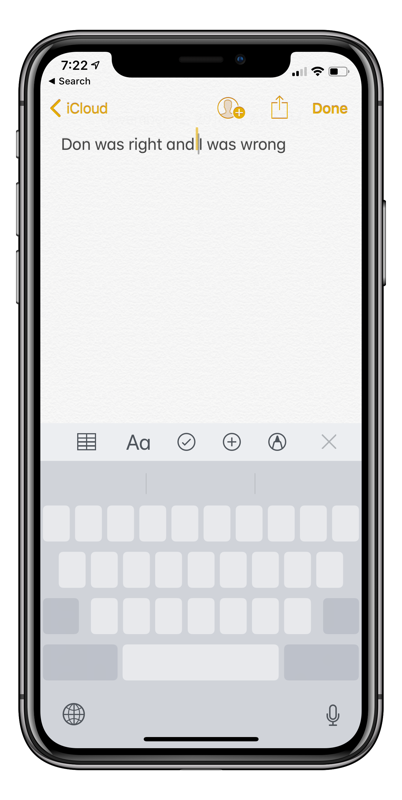 In the tutorial, he explained that now with iOS you can tap and hold on the spacebar and the keyboard will magically turn into a trackpad, allowing you to easily slide around to move the insertion point in text. As I was watching, I thought, “Poor Don, he doesn’t know that you’ve been able to turn the iPad keyboard into a trackpad for ages!” All you have to do is use two fingers on the keyboard anywhere and it suddenly turns into a trackpad. You don’t have to be on the spacebar like he thought. For some reason I procrastinated on making fun of him (that’s SO not like me). Then I heard on a podcast people talking about the loss of 3D Touch in the future (not sure if that’s a rumor or fact). Someone on the show referred to how useful it is to use 3D Touch to move the cursor insertion point on iOS. Personally, I hate using 3D Touch to move my cursor around. It works and moves the cursor to the right spot as I direct it, but when I let go, the cursor jumps at least a full word away from where I left it. I try really hard to not jiggle as I move my finger away but whatever I do, the cursor is never where I want it. But then I got this little niggle in the back of my brain. What if Don was actually onto something. What if there was a change to iOS that let you turn the keyboard into a trackpad by gently holding on the spacebar? And more importantly what if it worked on the iPhone? Would I be able to abandon one of the only uses I’ve found for 3D Touch? Well, guess what? In iOS 12, on iPad AND iPhone, if you simply tap and hold on the spacebar, you get a stress-free, gentle way to move the insertion point to exactly where you want it, and there isn’t a violent letting go that shifts it away! You can tell you’re doing it right if as you hold on the spacebar, all of the letters on the keys disappear and the whole keyboard turns grey. Then gently start sliding around. So, yeah, Don was right. But don’t tell him, ok? Let’s keep this Tiny Tip between us? Excellent! I had no idea. I like that with 3D Toouch on the iPhone you get the cursor from anywhere on the keyboard, not just the space bar, just because I don’t Ike having to use two fingers for it.